The first stroke play event of the 2017 Flagstick.com Players Tour for members of the PGA of Canada – Ottawa Zone is in the books. The BPG (Boutiques Pro Golf) Spring Open was held on Monday, June 5th at the Pakenham Golf & Country Club in Pakenham, Ontario, northwest of Ottawa. Graham Gunn, from the Gunn Academy at White Sands, took home the first-place cheque with his two under par score of 70 on the Island and Canyon nines. He was followed closely by Rivermead Golf Club’s Bob Flaro who posted an even par round of 72. 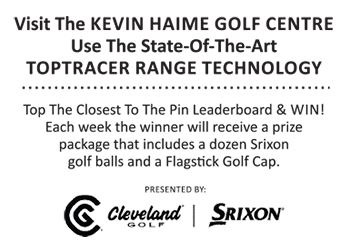 Flagstick Golf Magazine caught up with the Flagstick.com Players Tour Spring Open winner and asked about his game. Earlier this year host professional Chris Learmonth told Flagstick.com that he was happy to be hosting his fellow professionals, especially since many had mentioned not having played his course in some time. “We’ll be in good shape and ready for them,” said Learmonth, a former PGA of Canada – Ottawa Zone Champion. Thanks to the efforts of Pakenham’s greenkeeper Mandy Payne and her staff, the course was ready and players were happy with the course conditions in spite of the cool and wet spring in the Ottawa Valley. In the Senior Division of the Flagstick.com Players Tour Spring Open, Champlain’s Jean Pilon posted a 76 for the win followed closely by Golf O Max’s John Watson. Ottawa Zone golf professionals were also treated to an assorted supply of licorice and candies at the first tee, just another touch by their new Executive Director. You know that you’re welcomed when the club captain and some of the members volunteer to spend the day forecaddying. Thanks to Dan LeClerc, Bob Henry, Eddie Finnegan and Richard Tessier for their efforts. As well, the food and beverage staff under Cindy Clouthier took care of the wants and needs of everyone. Club President John Stokes welcomed the PGA of Canada – Ottawa Zone golf professionals Pakenham and invited them to come back in the future. Zone Captains Colin Orr and Bill Keating thanked the staff and volunteers at Pakenham as well as the Fleming Family for offering their course for the Spring Open. Next up on the Flagstick.com Players Tour for PGA of Canada – Ottawa Zone golf professionals is the Serge Giroux Charity event and the Summer Open, both being hosted at the Kanata Golf & Country Club.